The aroma of a garlic-laden tomato sauce spiked with sausage, meatballs, and rolled-up meat Braciola can bring tears to the eyes of many Italian-Americans. 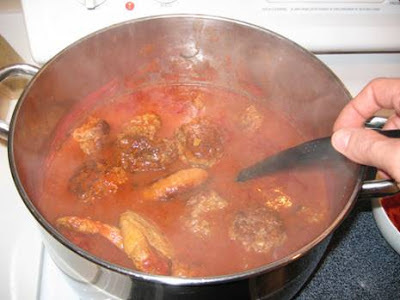 Sunday gravy, also known as Sunday sauce, evokes memories of weekend family gatherings in which mom or grandma presided over the constantly stirred pot of sauce and meat, and various relatives were tasked with procuring the essential provisions—the cannoli and sesame bread from the bakery or the wine from the cellar. The proprietors of Frankies Spuntino restaurant in Brooklyn, Frank Falcinelli and Frank Castronovo, write that “Sunday sauce—the meal, the menu, the way of life—is the source and summation’’ of their restaurant business. The best Sunday gravy simmers on the stove for hours, permitting the ingredients (the meat choices are seemingly limitless) to infuse the sauce with an unparalleled meatiness that no quickie marinara could ever hope to replicate. The long, slow cooking time was also time for families to spend with each other, reinforcing ties that could withstand the harsh realities of the outside world. Along with the other staples of Italian-American cuisine, Sunday gravy has vaulted from family food to the culinary mainstream, even as a once-in-a-while treat for today’s health-conscious eaters. TV food stars Rachael Ray and Giada De Laurentiis regularly feature touched-up variations on the classic Italian-American repertoire. And, although “The Sopranos” is widely despised by Italian-Americans for its twisted depiction of their cherished family values, the show often featured sumptuous Sunday meals with pots and pots of sauce, meat, and pasta—and the cookbook spawned by the show features a Sunday gravy recipe. For better or worse, 21st-century America has made celebrating the Sunday tradition much more difficult for families. “Sunday is now a time for attending soccer games, getting in 18 holes of golf … or watching three NFL games without interruption,” Mariani says.